BOSS 2020 determined that the chief impediment to economic growth in the business district was heavy vehicle traffic congestion caused by two major misaligned crossroad intersections in the borough’s core. The Committee developed an ‘Official Map’ that realigns these intersections into traditional right-angle configuration. Additionally, the Official Map creates a new through street parallel to and south of the main east-west corridor, U.S. Route 422, Penn Avenue. This new through street will serve two purposes, 1) to connect the eastern and western north-south routes on either side of the central business district and 2) act as the Borough’s new downtown ‘Main Street’ that allows access to over 20 acres of under-developed commercial land in the district. In 2009, BOSS 2020 conducted a professional traffic study which confirmed that the Official Map infrastructure plan would significantly reduce traffic congestion. In 2010, the Committee contracted with a professional architectural firm to envision a preliminary plan for the redevelopment of the 20 acres into a New Town Center development using the principles of ‘new urbanism’ and ‘smart growth’. The four-phased plan for revitalization is well underway. Phase 1 on the eastern edge of the central business district was redeveloped in 2010 as a 10-acre modern shopping destination known as Spring Market Center which now serves the community and generates tens of thousands of dollars in business tax revenue for the Borough. In the near future, the center will expand to include new and popular businesses. Phase 2 of the Revitalization Plan will realign the western CBD intersection of Penn, Columbia and Cacoosing Avenues allowing for improvements in semi and tanker truck traffic maneuverability from nearby refineries while relieving much of the business district’s traffic congestion. This Phase is fully funded and is scheduled for construction in 2017-2018. Phase 3, constructing the new downtown Main Street and through street connector is in engineering. This new thoroughfare is the lynch pin of the BOSS 2020 revitalization plan and will create economic sustainability for the Borough. Phase 3 will be constructed beginning in 2017 using two awarded grants from the State’s Multimodal Transportation Fund Program; $784,000 from PennDOT and $1.1 million from DCED. Additional funding will come from the Borough, the Berks County Redevelopment Authority and private developers. This phase is expected to be completed by 2019. Finally, Phase 4 of the infrastructure plan realigns the eastern CBD intersection of Penn, Shillington and Mull Avenues thereby completing the traffic circulation and alleviating the remaining cause of congestion. 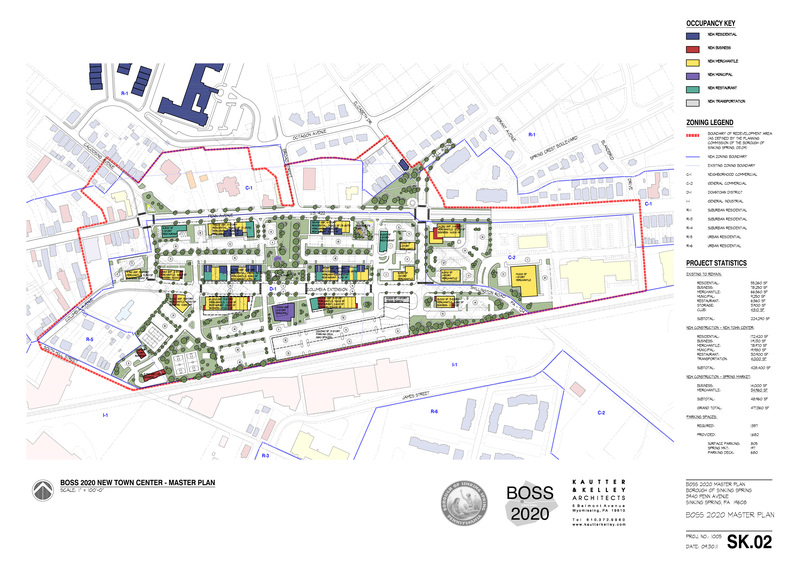 BOSS 2020 is working with private enterprise and other County and State agencies in a cooperative effort to begin engineering and design as soon as possible. The current estimate is to complete Phase 4 by 2020. 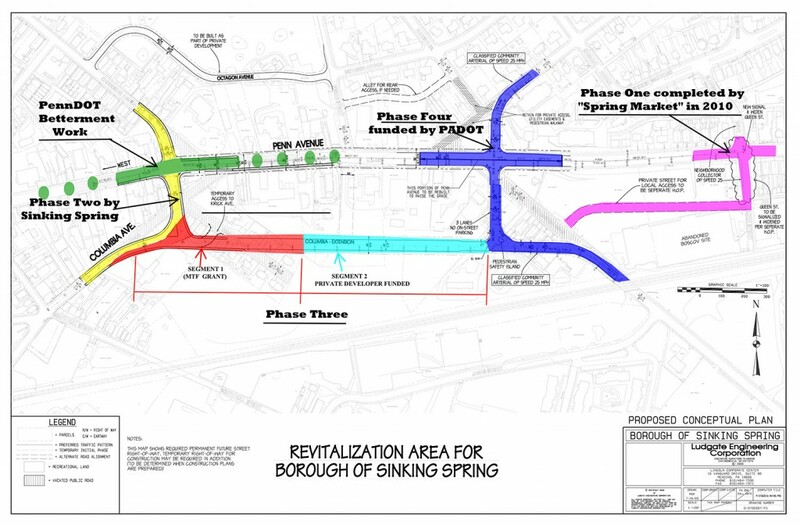 The BOSS 2020 Revitalization Committee meets monthly on the 3rd Thursday of every month at 7:00 PM in Sinking Spring Borough Hall at 3940 Penn Avenue. Meetings are public and Committee membership is open to all.